will enable an authorized KIA dealer to duplicate the keys easily. Remove the bar code tag and store it in a safe place. Also, record the code number and keep it in a safe place (not in the vehicle). • Used to start the engine. • Used to lock and unlock the doors. • Used to lock and unlock the glove box. WARNING - Ignition key Leaving children unattended in a vehicle with the ignition key is dangerous even if the key is not in the ignition switch. Children copy adults and they could place the key in the ignition switch. The ignition key would enable children to operate power windows or other controls, or even make the vehicle move, which could result in serious bodily injury or even death. Never leave the keys in your vehicle with unsupervised children. Immobilizer system (if equipped) Your vehicle may be equipped with an electronic engine immobilizer system to reduce the risk of unauthorized vehicle use. Your immobilizer system is comprised of a small transponder in the ignition key and electronic devices inside the vehicle. With the immobilizer system, whenever you insert your ignition key into the ignition switch and turn it to ON, it checks and determines and verifies that the ignition key is valid. To deactivate the immobilizer system: Insert the ignition key into the key cylinder and turn it to the ON position. 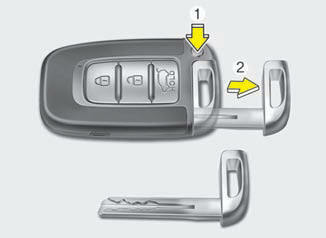 To activate the immobilizer system: Turn the ignition key to the OFF position. The immobilizer system activates automatically. Without a valid ignition key for your vehicle, the engine will not start. When starting the engine, do not use the key with other immobilizer keys around. Otherwise the engine may not start or may stop soon after it starts. Keep each key separately in order to avoid a starting malfunction. Do not put metal accessories near the ignition switch. Metal accessories may interrupt the transponder signal and may prevent the engine from being started. If you need additional keys or lose your keys, consult an authorized KIA dealer. The transponder in your ignition key is an important part of the immobilizer system. It is designed to give years of trouble-free service, however you should avoid exposure to moisture, static electricity and rough handling. Immobilizer system malfunction could occur. Do not change, alter or adjust the immobilizer system because it could cause the immobilizer system to malfunction and should only be serviced by an authorized KIA dealer. Malfunctions caused by improper alterations, adjustments or modifications to the immobilizer system are not covered by your vehicle manufacturer warranty. This device complies with Industry Canada Standard RSS-210. Limp home (override) procedure When you turn the ignition switch to the ON position, if the immobilizer indicator ( ) goes off after blinking 5 times, your transponder equipped in the ignition key is out of order. You cannot start the engine without the lime home procedure. To start the engine, you have to input your password by using the ignition switch. The following procedure is how to input your password of “2345” as an example. The immobilizer indicator ( ) will blink 5 times and go off indicating the beginning of the limp home procedure. 2. Turn the ignition switch to the ACC position. 3. To enter the first digit (in this example “2”), turn the ignition switch to the ON and ACC position twice. Perform the same procedure for the next digits between 3 seconds and 10 seconds (for example, for “3”, turn the ignition ON and ACC 3 times). 4. If all of the digits have been input successfully, you have to start the engine within 30 seconds. If you attempt to start the engine after 30 seconds, the engine will not start and you will have to input your password again. After performing the limp home procedure, you have to see an authorized KIA dealer immediately to inspect and repair your ignition key or immobilizer system.